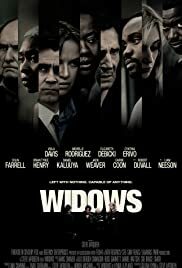 Drama heavyweight director of critical hits like HUNGER and 12 YEARS A SLAVE attempts an action packed pyro-technics thriller WIDOWS with quite an impressive cast of heavyweights headed by Viola Davis. 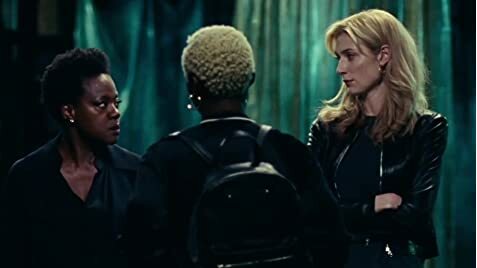 WIDOWS is that rare action movie centring on women proving that they too can carry an action film. The script is by GONE GIRL author Gillian Flynn. Veronica (Davis) lives an idyllic life in Chicago, ensconced in the loving arms of her husband, Rawlins (Liam Neeson), and in their luxurious condo. But Rawlins bought that cushy life robbing people, unknown to Veronica, a teacher in the Chicago education system. (There is no scene of Veronica at her work.) When a job with his gang goes fatally wrong, Veronica’s life falls to pieces. With a local crime lord (Brian Tyree Henry) and his muscle (Daniel Kaluuya) pressing her to pay Rawlins’s $2 million debt, Veronica realizes her late husband’s shady business sees only one option: round up the three other women who had slept for years next to these seasoned criminals, and make a plan left by her husband to win their lives back. There is also a side plot involving the crime lord running for office against another crooked white politician Tom Mulligan (Colin Farrell). The film’s most interesting character is Tom Mulligan. Tom exerts a power both within and beyond the law, pushed by his father (Robert Duvall). Tom appears to be a worthy candidate but deep inside, he is fed up of the father’s dynasty in Chicago and wants out. It is not surprising that the film is at its most interesting when McQueen deals with the drama rather than the action as in the film’s best scene – the confrontation between Farrell and Duvall. To make the heist film more personal, the film interweaves the lives and hence, problems of the 4 widows that undertake the heist. Each have their own burdens. The other three are played by Michelle Rodriguez, Cynthia Erivo, and Elizabeth Debicki all of whom shine in their roles. McQueen has achieved the rare feat of being able to elicit unforgettable performances – not from a few but from his entire cast. The best two performances belong to Farrell who is aided by the most intriguing written character and GET OUT’s immediately recognizable Daniel Kaluuya who demonstrates how smooth violence can be executed. As this is McQueen’s first action flick, one can see him trying too hard at times. The romantic scenes are a bit too livid for comfort, all the kissing scenes involving the tongue. This results in the kissing scene (mixed race) between Viola Davis and Liam Neeson that would make quite a few quite uncomfortable. Credit for trying. As a thriller, WIDOWS contains quite a few plot twists. Well written and inserted into the storyline, they serve to enrich the drama rather than just being there for the sole purpose of surprise, a tactic that seems now too common in most Hollywood thrillers. WIDOWS premiered successfully at the Toronto International Film Festival to general favourable reviews. WIDOWS should not only please McQueen’s fan base but extend his career into the Hollywood mainstream. FENCES is the film adaptation of the Pulitzer Prize source material by August Wilson, who passed on in 2005. His only demand for consent of his play being filmed was that it be directed by an African American. So, when Denzel Washington came on board, Wilson could not be too pleased in his grave. FENCES has been produced twice on Broadway with James Earl Jones in the title role in the first production and Washington in the title role in the second. Both won Tonys for their performances. Washington does justice in his directorial debut, with Viola Davis, playing his long-suffering wife of 18 years. Davis also won a Tony for her performance in the second production on Broadway, and she just shines in her role in the film. The 2016 Best Supporting Actress Oscar is practically hers. As the film opens, Troy (Washington) is working his garbage collection job with his buddy Bono (Stephen Henderson). The camera is proud to span the streets of the city filled with the vintage cars of the 50’s period when the story is set. There is not only two or three cars but a dozen or more – to show that director Washington spares no expense to take his film out into the open. There are as many sets as there are story set-ups. But the film still feels stagey – not for any fault of Washington but for the well written dialogue that come out of the actors’ mouths as written by August Wilson. The film looks stagey. This is expected as the film is based on a play. The same can be said for all Neil Simon film adapted plays (THE ODD COUPLE, MURDER BY DEATH, THE CHEAP DETECTIVE) or for Norman Jewison’s adapted play films like A SOLDIER’S STORY and AGNES OF GOD. At least film audiences get a chance to see a good play – when adapted to the screen. And FENCES is more than a proficiently adapted play on film with the play’s two stars reprising their roles – and performing their best as well. As an African American film, FENCES is more positive compared to the other recent ones like MOONLIGHT, THE BIRTH OF A NATION and LOVING. The main character, Troy a black worker believes in the working class system. In fact when he complains that he should be given the position of driver of a trash truck as only whites have been given that opportunity, the complaint gives him the promotion. But Troy is his own worst enemy. He enforces the system he believes in but not for his two sons, For them, hard work achieves results and nothing else. When his younger son is offered the chance of a football scholarship, he resents and prevents his son the opportunity. But it is when he cheats on his wife Rose (Viola Davis) that all hell breaks loose. Sample of confrontation scene as shown in the trailer: Troy: It’s not easy for me to admit that I’ve been standing in the same place for eighteen years! Rose: Well, I’ve been standing with you! I gave eighteen years of my life to stand in the same spot as you! This marks the film’s best segment – well worth the price of the admission ticket. The film, a bit dated, shows the tragedy of the black working class, but it can be apply to white working class folk as well. FENCES has many good reasons to be seen – Viola and Washington’s Oscar winning performances, the convincing period setting, but most of all August Wilson’s brilliant written words performed on screen. It is seldom that a hardworking American hero with good heart is laid bare faults and all – due to the fact that no human being can be perfect. The film opens Christmas Day. [on why she’s not inspired to direct] I can’t deal with actors! I can’t deal with myself. We’re neurotic and miserable… I love doing what I’m doing, but while I’m doing it, I’m miserable.